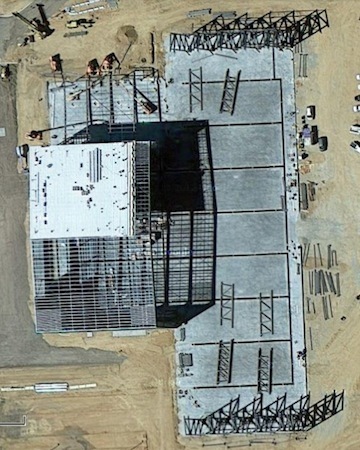 Google Maps’ updated view of the Mojave Air and Space Port shows the Stratolaunch hangar under development (above). This image, taken some time ago, shows the roof being placed on the back end of the building (left) with beams for the front end’s walls already raised in place (right). Today, the rear roof has been completed. At the front of the building, the roof structure and parts of the exterior walls are now in place. 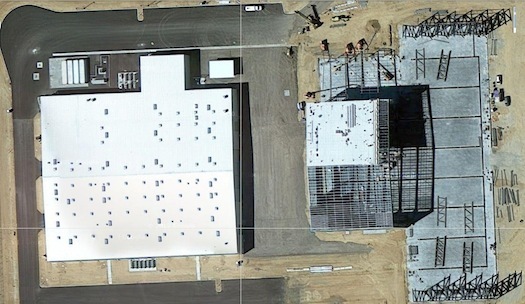 The image above shows Stratolaunch’s 88,000-square-foot production facility (left) and the unfinished hangar. The manufacturing facility was completed about three weeks ago and is now occupied by employees. Vostochny: A Spaceport to Nowhere?